The dual-time display is one of the most useful horological complications. It enables its user to keep simultaneous track of the time in two different parts of the world. With the new Renaissance “7 Time Zones” model, Aerowatch offers a unique mechanical watch that complements local time by a display of the time in no less than six cities across the planet. This in-house developed model is a must-have instrument for men and women who need to keep in frequent touch with the entire world. At a glance and with the help of 24-hour displays, the user can check whether such or such a city is waking up or going to sleep. 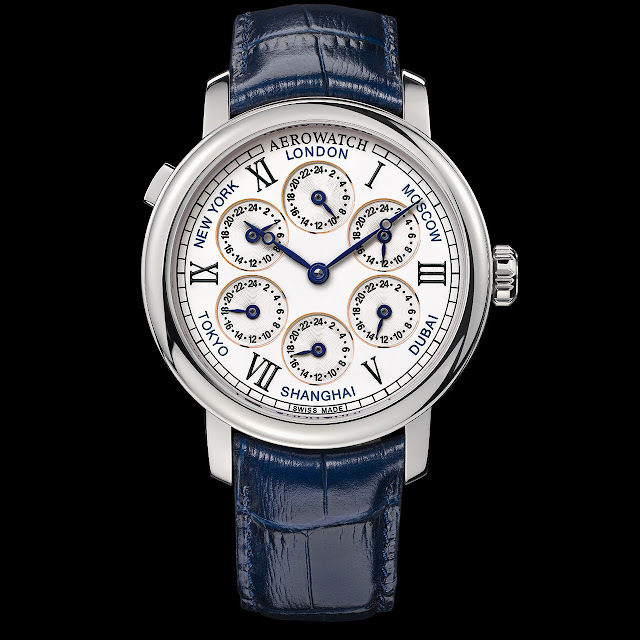 This daring and highly legible model perfectly embodies the determination manifested by Aerowatch to offer ambitious mechanical watchmaking at affordable prices. Mechanical hand-wound ETA Calibre 6497-1, 161/2 lignes, 17 jewels, 18,000 vib/h, additional module developed by Aerowatch and Fred-Eric Bolzli. Rhodiumed “Côtes de Genève” decorations, circular graining and blued screws. Hours, minutes and six additional time zones. Satin-brushed or black PVD-treated 316L steel, 44 mm. 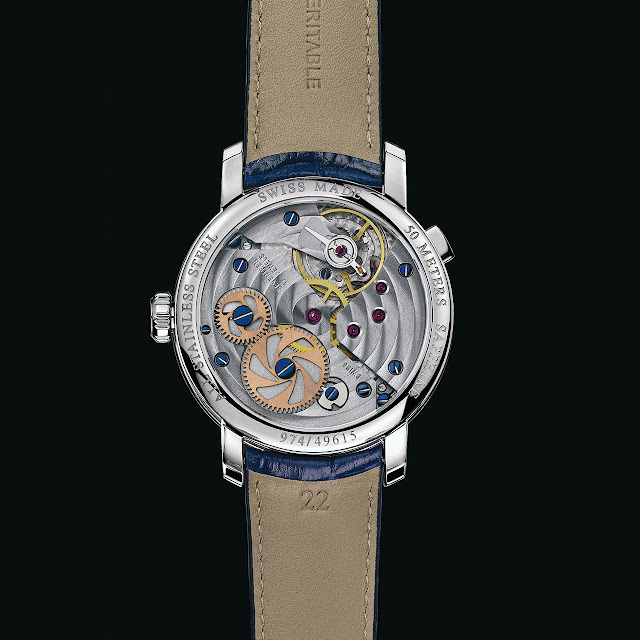 Cambered sapphire crystal and transparent caseback, water-resistant to 50 m (5 bar/165 ft). 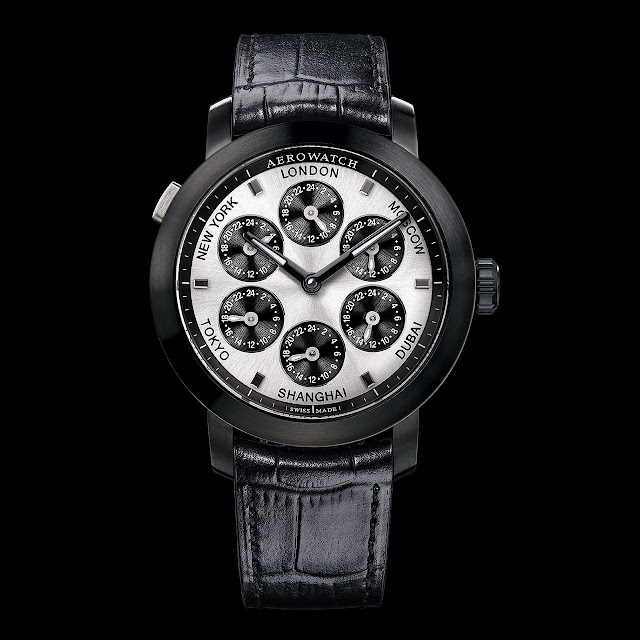 Sunburst brushed silver-toned dial with black satin-brushed ring and white minute track. Six black satin-brushed 24-hour counters (LONDON, MOSCOW, DUBAI, TOKYO, SHANGHAI, NEW YORK). Black leather with folding clasp.